We’ve provided this handy Help Page to assist in any issues you may encounter with your listening experience. visit our Podcast Apps Help Page. We’ve provided the most common help topics folks ask about. If you need to speak with our Member Services staff, just give us a call or send us an email with your question. Click the Contact Us tab on the main menu to send a request or call 1.800.829.5646 and we’d be happy to help! Be sure to check out our Membership Guide for handy tips on how to get the most out of your subscription! In the upper right-hand corner of the web page is the My Account menu. From there you can change all aspects of your subscription. Click My Profile to modify your contact info. Click Change Password to update your password. Click Manage Subscriptions to stop recurring billing or upgrade, renew or cancel your subscription, or upgrade to Group Access. Click My Payment Methods to add, edit or remove a credit card. Also handy for updating your card expiration date. Click My Transactions to list all the subscription transactions charged on your account. Click My Group to manage your group, add or remove members and buy additional members. You can also click the Listen Now button to go straight to the program, or view the Membership Guide. If you have expired, you can click Renew Subscription or upgrade your existing subscription. Who is SOS Groups for? Anybody who wants to sponsor a group of two or more subscribers at a discount. Groups get the weekly Steel on Steel program and full archives with Premium access, including the Veritas Lounge starting at half-off standard pricing. Have questions? Learn more. The Group Access option is perfect for sharing Steel on Steel with extended family and friends, small study groups, homeschool co-ops, churches and more. The bounds are limitless and we have *special pricing for larger groups as well. As a SOS Group Owner, you get 50% off your Premium membership and added members, with even deeper discounts for larger groups. See our Group tiered pricing and more help items. You can even get started with no change in your current subscription rate. Your sponsored group member will have their own prepaid, independent account with their own login information so they can set up their podcast apps and manage their own accounts. All Group members have the benefits of full Premium access and they pay absolutely nothing. Simply login to your account and click the ‘My Group’ link. You can easily add members manually bu clicking the Add New Member link. On the next page, enter the new member’s email, a temporary password, first and last name, then submit. If you see your email address and password auto-filled, just replace your login details with the new member’s info. Get more help here. Be sure to check that your username and password are correct; remember, the login info is case-sensitive. There’s a Forgot Password link under the login fields if you need to reset your password. Listening is simple. You can play the show right in your browser with the embedded player, or download the show to your computer for offline playback through a media player or MP3 player. To update or enter the credit card used for auto-billing on your subscription, first login from the homepage or My Account Page tab. From the Control Panel click ‘My Payment Methods‘ and then Choose either Add New Credit Card if you don’t have one entered, or if you need to change the card click ‘Edit‘ or ‘Delete‘. Rest assured, we take your personal and financial information very seriously. We don’t store any financial information on our site or servers. Your transactions are digitally encrypted and we use a process called tokenization to send your payment request to the credit card processor. We never share your email address or personal information with anyone, ever. We are also PCI/DSS compliant and you can even verify our status by clicking the Trustwave badge! It’s simple to shut off recurring billing for your subscription. When you first login, you’ll see the ‘My Account’ page. From there, click ‘Manage Subscriptions‘. To the right of the panel under Status, select ‘Stop Auto-Billing‘. You’ll be able to continue your subscription without being billed at the end of your term. If you change your mind and would like to continue to have your credit card billed at the end of your subscription term; just click ‘Start Auto Billing‘. By default, all of our subscriptions except the free trial start off with auto-recurring billing. If you’ve been charged in error, just give us a call and we’ll refund your transaction. Login with the current username and password, then in the My Account Page, select ‘Change Password‘. Enter your old password, then enter a new one. If you want to change your username you must either email us members@steelonsteel.com or call us at 1.800.829.5646 and we can do that for you! When your subscription reaches the end of it’s term (Billing Cycle) or we’re unable to charge your credit card, You’ll receive an email letting you know. When you visit the site, you’ll also be prompted to renew in the Recent Broadcasts page with this message: ‘Your subscription is not current. Please upgrade your account to download complete episodes’. Simply login and click ‘Manage Subscriptions‘. You’ll be taken to a renewal screen where you can complete the renewal process. After renewing, you’ll be able to access the broadcasts immediately. To view your recent transactions, click ‘My Transactions‘. To cancel your subscription immediately, login and click ‘Manage Subscriptions’ in the My Account Page. Click ‘Cancel Subscription‘. Your billing will stop and your access to the shows will cease. However, we’ll keep your account profile with your login details and email available for one year in case you want to reactivate your subscription without the hassle of entering all that information. If you do change your mind and want to renew within the one year reservation, simply log into your ‘My Account Page’ and reactivate your membership in the ‘Manage Subscriptions‘ tab. Once the one year reservation has passed, you’ll need to sign-up again under the original ‘Subscribe‘ page if you want to listen. Please let us know the reason you’re cancelling so we can resolve any issues you may have encountered. Check out our Podcast Apps Help Page. from there, you can download a podcast app to listen to the weekly Steel on Steel shows! Our RSS feed requires authentication, so we suggest using BeyondPod and Podcast Addict for Android. Apple has discontinued support for secure podcasts like ours though the Apple Podcast App. The solution? Use an alternate app like Downcast or RSSRadio. Check out our Podcast Apps Help Page. You may also simply download the weekly Steel on Steel program through iTunes on your Mac or PC and sync your iPhone or iPad to transfer the shows. You can still access the programs through the Safari web browser on your devices; just login, click ‘Listen Now‘ and tap the yellow download icon in the weekly show post. Data usage rates may apply. If entering your correct username and password doesn’t work, you’ll need to remove the stored podcast and logins from other devices you sync from. This can occur when you’ve changed the stored Steel on Steel account info on another device or computer (typically iTunes) and then synced or restored a backup to the new device from your computer or iCloud. Please note: cancelling your subscription will not solve the issue with the popup. Start by turning off the wifi connection before removing the Steel on Steel podcast from the affected device. You should also remove the podcast from any computers you use to sync from. Always restart your device to confirm the setting changes. The podcast can easily be set back up and synced to your mobile devices or use a podcast app like Downcast to access the show on your iOS devices. iTunes for Mac or PC. In the top left corner in iTunes, you’ll see the main menu. Click the ‘File’ button and then ‘Subscribe to Podcast’. Copy and paste, or enter the above address (URL) into the text box. Once you’re subscribed, click an episode to start the download. A login popup will appear. Enter your username and password to complete the process. You can access the Podcast either from within iTunes or from a podcast app on your mobile devices. If iTunes won’t download the program, first login to your account at steelonsteel.com and check that your subscription is current and active and that you can download the show from there. 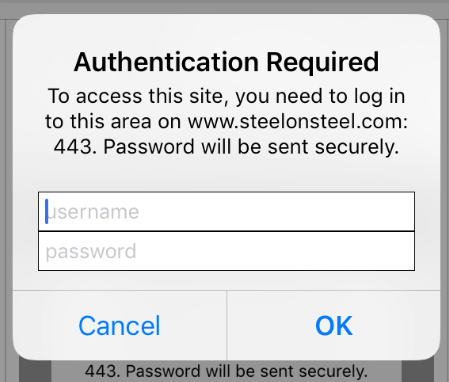 Next, keep in mind, authenticated RSS feeds like ours need two things: the feed URL (see above), and your Steel on Steel member username and password. If the feed displays the episodes but you are unable to download, you may need to update the stored login info for the podcast. If you are using a Mac, the password is stored in your Keychain, found in Applications>Utilities>Keychain.app. Open the Keychain and search for Steel on Steel. Either delete the entry or modify the login info. You may need to remove the Steel on Steel podcast from your iTunes Podcast Library and set it back up. Be sure to use correct login information and remember, login info is case-sensitive. PC users will have to unsubscribe from the podcast in iTunes, delete it from the library, and resubscribe. Afterward, you will need to re-enter your Steel on Steel login info. Please note: Do not unsubscribe from your membership at steelonsteel.com and attempt to resubscribe. The download issue is with the stored login info in iTunes. We store the downloadable broadcasts online for six months. If you are a member you can access them on the Recent Broadcasts page. If you would like older archives, you now have the option to purchase an entire year (all 52 shows) in .mp3 Format on a single DVD disc for only $25 or a handy USB flash drive for $35. Click to visit our Media Store. If you don’t want to download an MP3 but would rather have the program on Audio CD, we have those too! Click here to visit our Media Store! We have an interactive Program Guide that displays every episode we’ve aired since the beginning of 2002! You can find it to the left of this page near the top. However, those shows are only available to download with an annual Premium subscription. Subscribe to get started! You may also purchase them on Audio CD in our Media Store! Unfortunately, the length of current shows are beyond the burn length of standard 80min. CDs. Use an MP3 player or podcast app on a mobile device to take Steel on Steel with you wherever you go. Still want a CD? We have shortened versions of the weekly broadcasts in our Media Store. Due to program length, these discs do not contain the Section 6 brief.